← Ronald H. Mahaffey Jr.
SPRINGFIELD, MO, December 3, 2012, Katherine “Kitsy” Hart, BS, MT (ASCP), Medical Technologist at Mercy Laboratory Services/Smith Glynn Callaway Clinic, has been recognized by Elite American Executives for dedication, achievements, and leadership in laboratory services. Specializing in laboratory operations and services, Ms. Hart makes the most of her expertise in the arena by skillfully performing all laboratory tests for Mercy clinics and urgent care centers. Ms. Hart holds more than 50 years of professional experience, and she continuously strives for excellence in her endeavors. She attributes her success to her excellent teachers, values, passion for her work, upbeat and energetic personality, and desire to provide excellent customer and patient care. Ms. Hart became involved in her profession because she always enjoyed chemistry and wanted to help people. She is very proud to be affiliated with St. John’s Smith Glynn Callaway Clinic and abides by their motto of offering compassionate care and exceptional service. The medical clinic is rated number one in integrated care. Through the years, she also worked at the American Red Cross for 15 years in their bloodmobile. She is very proud that donors only wanted her; she has very gentle and soft touch and is proud to say that she had an excellent teacher. 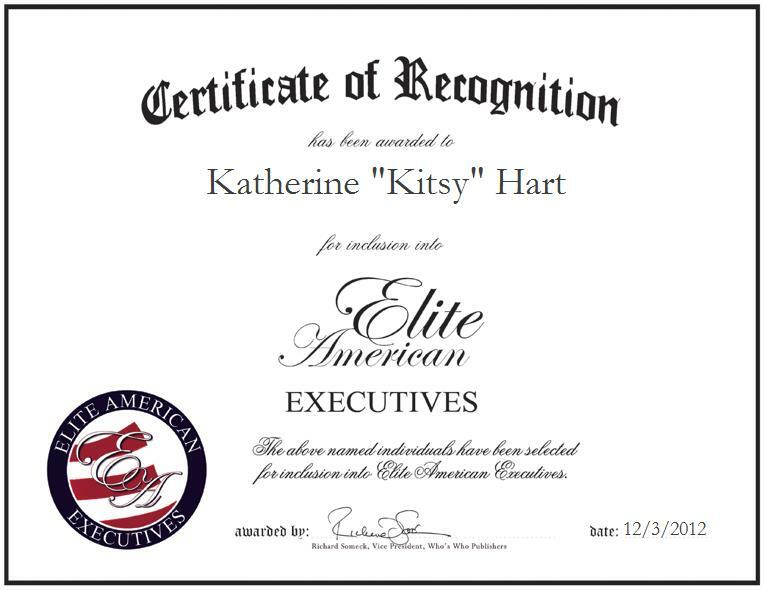 Katherine “Kitsy” Hart, BS, MT, (ASCP) was originally selected for inclusion in EliteAMERICAN Executives in December 2012. We are proud to be featuring Ms. Hart again in EliteAMERICAN Executives for 2014-15.